Get Messages from the Beyond! Eight secrets for Automatic Writing that guarantee your success for connecting with higher realms. Automatic Writing is a form of spirit communication that’s been practiced for the last 150 years. 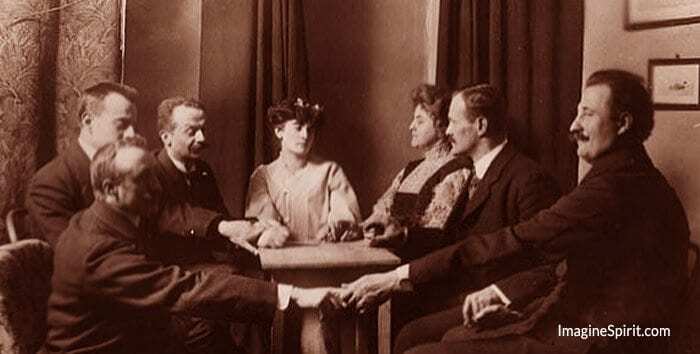 Automatic writing first made its appearance in the early spiritualist movement (between 1850-1860) in America. Writing automatically is the process of allowing spirits, spirit guides, or the higher self to manipulate your hand and arm. The purpose is to write answers to questions posed, or to receive messages from astral entities. With practice and sticktoitiveness, anyone can do automatic writing. Writing is done with the unconscious use of the muscles in the arm and hand usually in partnership with the spirit or spirit guide that is communicating. It’s not the living person that actually moves the hand, but the spirit using their brain and kinetic energy to influence the writing. Many individuals have used automatic writing and have been quite successful in receiving verifiable messages from Spirits. Practicing automatic writing is a valuable source of information for either growing in your spiritual journey or for making spirit contact. True automatic writing is different from what’s called, Inspirational Writing. When doing inspirational writing, the individual has opened their psychic senses and direct their consciousness to the higher realms. Specifically, they use their own hand muscles to record the words that they’re sensing or hearing. Secret #1. You Can Do It Anywhere! The beauty of automatic writing is that you can do it anywhere and without having to focus on what you’re doing. Some call this non-directed writing. Specifically, all you need to do is to sit at a table or on a couch holding a pen or pencil and have several large sheets of paper in front of or beside you. I sometimes like to work on my blogs at a favorite coffee shop hangout of mine. I’ll find a booth and have sheets of paper on my left side. Then I focus on my computer and let my hand and arm do the rest. One time I even got a message that I should begin my book! One of the most amazing facets of doing automatic writing is that you don’t have to focus on what you’re doing. People do automatic writing when watching television, on their computer, reading a book or magazine, or even when chatting with someone else. Most of all, if you overly focus on your hand and pen, most likely your conscious mind will come into play. You’ll start to write something that you’re directing rather than letting the spirit or guide come in and communicate freely. The same applies for connecting with your Higher Self for messages. Finally, try and forget that you are holding the pen. Not surprising, once your hand starts to move, you’ll have an almost irresistible urge to look down and see what’s being written. Try to avoid doing this. Get absorbed in your TV program, YouTube movie, book or activity, and let your hand do its thing. Secret #3. Try Not to Give Up Too Soon! Because nothing seems to be happening at first, a lot of individuals give up too soon. This undertaking requires patience and trust that your hand will eventually begin to write without you having to direct it. In my first attempts at automatic writing, I did get discouraged and I felt like giving up, but happily, I kept at it. About two weeks into my efforts, my hand began to move on its own and bits of scrawls started to appear. Moreover, in another few weeks, I could make out phrases and short sentences on my paper. The only drawback was that I had a hard time deciphering what I’d written. Studying the script, I became more adept at understanding the text. As time went on, I moved on to inspiration writing; however, I’ve kept my pages in a special box. Once the spiritual energy that is communicating gets used to your muscle power, the hand will start to move very quickly. Interestingly, once you get going, your hand will fly across the page and writing is significantly faster than normal. Have several sheets of paper when practicing automatic writing and there’s a good reason for this. At first, you’ll be making large marks and loops and will come to the bottom of the page quickly. That’s why I use sheets of large artist paper. I pull the sheets out of the binding and place them in a neat pile in front of me. The sheets of paper can be whisked away as you reach the bottom of the paper. This allows you to keep writing without pausing. And, you don’t need to watch where the sheets go. Of important note, to keep the sheets in order, number each sheet before starting your session. This way you can reassemble the pages in the order that you wrote on them. If it’s easier for you, just use computer paper. Or, go to the dollar store and purchase a large children’s blank drawing paper tablet. This saves on paper cost. Secret #5. Don’t Lift Your Hand! Did I forget to mention the correct way to automatic write is to not lift your hand off the paper? And, you needn’t stop to dot the I’s or cross the T’s. Besides, this is a sure sign that you’re peeking at the paper. If you do happen to lift your arm or hand, the flow of information could stop and you’ll have to start over. After a while, you’ll get used to this practice and not even think about lifting your hand. It’s important to know with whom you want to write with before you begin. If you have a particular spirit guide that you know is with you, and you want to get clear messages from, you can use your skills of automatic writing to communicate. Or, you can connect with your Higher Self and begin asking questions. If you’re having difficulties, ask for an Ascended Master or Archangel of the Light to assist the entity that is communicating with you. They do this by sending waves of light energy that boosts the power of the being that is attempting to transmit messages. If your intent is to connect with spirits, always ask for a spirit helper guide or gatekeeper to be with you before commencing your session. And, it doesn’t hurt to do a little grounding and angelic protection prior to starting. »Over time, Padgett received over 3,000 messages. One of the advantages of automatic writing is that you don’t need to make a conscious connection with the spirit world to make spirit contact. If you’ve ever done formal spirit communication, you know that it takes a while to get into the right state of consciousness to receive spirits. And, you know that some effort is required. By using the technique of automatic writing, you won’t have to go through that. Some disagree with this and claim there has to be a rapport established with the spirit to make authentic contact. While it’s important to set an intention for making any kind of spirit contact, if no particular spirit has been called in, any number of spirits can show up. If a specific spirit(s) have been asked for, the wait to receive messages from them may take a little longer. One exciting part of automatic writing is when you notice that the handwriting is not yours! That’s when you really know that you’re making a genuine connection with spirits. Furthermore, many of the messages that you receive at first will seem incoherent and disconnected. What helps you to work through this issue, is doing a mental exercise like a crossword puzzle or performing simple mathematical calculations in your mind. For example, 1 + 1=2 and so forth is just fine. These are excellent, deep-rooting techniques to start with- especially if you suspect that your conscious mind keeps intruding into the session. Many automatic writers prefer to sit in a darkened room to do automatic writing if they have no luck in full light. Try this in varying degrees of darkness. Actually, it makes no difference what time of day you choose to do your automatic writing. Specifically, try to keep to a regular schedule for doing automatic writing. This ensures that the spirits are ready for you. Furthermore, many individuals like to automatic write later in the evening. Your home and outside noise is more likely to be quieter with less chance of interruption and loud noises. Secret #8. Protect from Negative Entities! If you start getting negative messages, stop everything right away and do some clearing and protection. It’s easy to do and shields you from any negative entities that attempt to intrude into your session. In fact, do this before you even begin to automatic write. 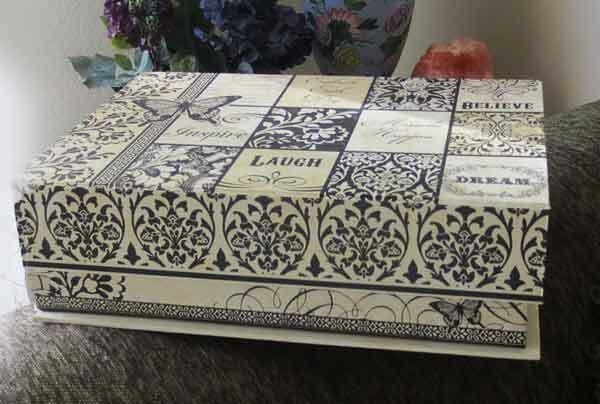 Finally, get a special box to stash your writings. Here’s my decorated cardboard archives container box I picked up at Hobby Lobby. Importantly, remember to date your papers and add any notes of what you experienced while doing automatic writing sessions. »Here’s a Wikipedia article on automatic writing that you might enjoy.